Make plans to audition for A Christmas Carol: In Concert! We’re excited to be producing this staged reading of the classic Dickens novella with music and dance. Performed by your friends and neighbors. We’re seeking singing actors ages 6 & Up to read various roles in a dramatized adaptation of the story. No experience on stage necessary. Only an enthusiasm and commitment to the project. Auditions will be held Wednesday October 10 from 6 – 10 pm. Please read all the details below before signing up. *CLICK HERE UP FOR AN AUDITION SLOT. EVEN THOUGH THE AUDITION SLOT IS 5 MINUTES, PLEASE BE PREPARED TO STAY 20-30 MINUTES TO SING IN GROUPS. You will be required to sing and read at the audition. No memorization required for audition or performance. But please do familiarize yourself with the materials. Ability to read music is not required but certainly helpful. Audition will consist of a simple song “We Wish You a Merry Christmas” that you will sing in a round with a group in your same audition slot. You will also be asked to read a short passage from the end of the novel. Click below to hear an MP3 recording of the song. Click We Wish You A Merry Christmas to download sheet music of the audition song. Click CHRISTMAS CAROL to download the audition speech. You will be auditioning for Music Director Roberta Wentling and Production Director & Adaptor Jimmy McDermott. Various roles are available for all genders and all ages over 6. There are both speaking and non-speaking roles. Everyone on stage will sing as an ensemble. There may be opportunities for solos or small group harmonies. The following roles have already been cast: Ebeneezer Scrooge, The Ghost of Christmas Past, The Ghost of Christmas Present, Jacob Marley, Bob Cratchit and Mrs. Cratchit. This is a volunteer opportunity. There is no pay. If cast, you may be asked to pay a nominal production fee to help offset prop and costuming costs. Callback Date is Thursday October 11 from 6 – 10 pm. Callbacks will be scheduled as needed after the initial audition by the Production Director. Callbacks will be held and scheduled as needed. If you do not receive a callback, it is still possible that you may be offered a role in the production. Rehearsals will be held on Wednesday and Thursday evenings starting as early as October 17th. There may be some rehearsals called on Friday evenings as needed. All auditions, rehearsals and performances will take place at The Community House unless otherwise notified. There will be no rehearsal on November 21st, 22nd or 23rd. PLEASE NOTE: Any roles are likely to double/triple/quadruple up as a result of auditions and/or over the course of rehearsal. You may receive an offer to appear in the ensemble. And you may be asked to take on another role “as cast” in addition to the role you may be offered. Unfortunately, requests to play a role or roles other than the track offered at the point of casting cannot be considered. By accepting to participate in the production, you understand that all “as cast” roles will be left to the discretion of the Production Director. 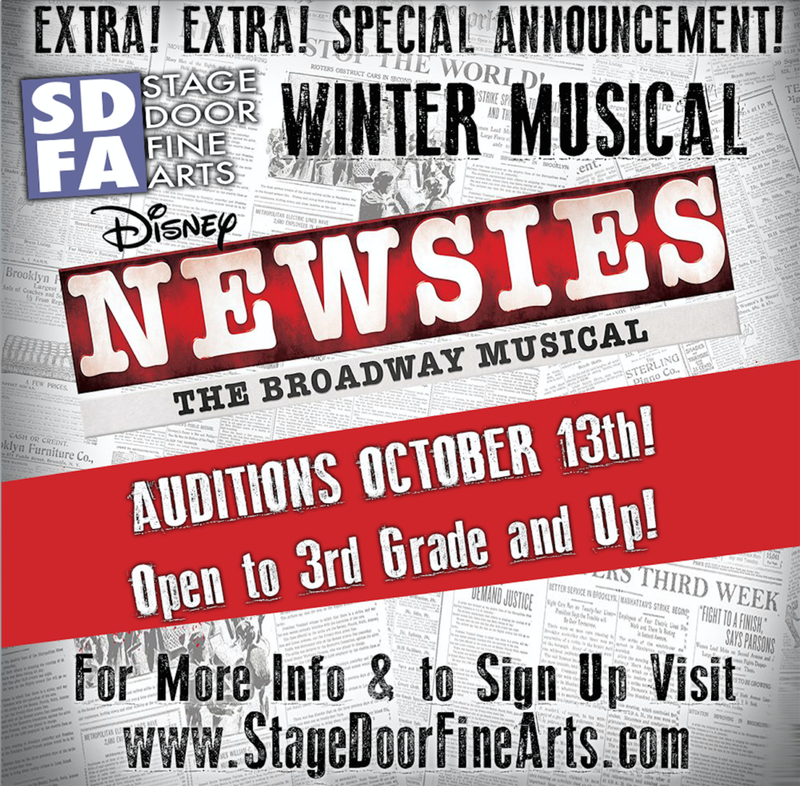 Audition to be part of another fantastic Stage Door Fine Arts Production — Newsies! Tons of great singing & dancing in this unforgettable show about the newspaper boys (& girls) on NYC. 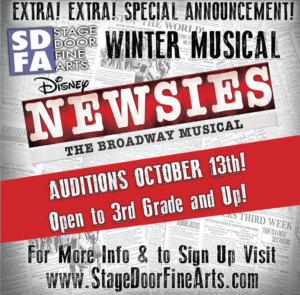 Auditions are Saturday October 13 from 1 – 8 pm. Click here to sign up for a time slot. All auditions will be held at The Community House. Open to anyone 3rd grade & up. Those in 6th Grade and up – Sing a song of your choice in the style of the show. (Contemporary Musical Theatre/Disney.) You must have an accompaniment track with no vocals that you will bring with you to the auditions. No A Capella Singing will be allowed! A MANDATORY dance audition workshop will be held on Friday, October 12th. Time and Location TBD! We will have callbacks on Sunday, October 14th if needed from 1:00-8:00. Those called back will sing more from the show, possibly dance and do readings. Tech Rehearsal will be start on Sunday 1/20 and be everyday after school 4:00-10:00 leading up to opening on January 25th.